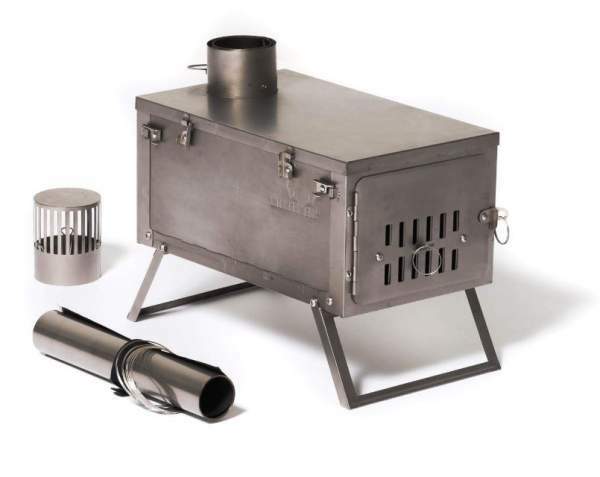 Here you have the list of the best tent stoves for wood burning available on the market in 2019 season, all top models with excellent features. Obviously, all the tent stoves in the list are for wood burning. But here you have a huge difference regarding the weight, so you have fully collapsible and backpack-portable stoves as well as heavy stoves that need a car for transportation. Regarding the material, the stoves in the list are built from any of the following materials: titanium, stainless steel, and steel. This affects the weight of course. All of them are with the pipe that connects to the stove on its top surface. So they are suitable for a pipe jack on the tent’s roof. But for some of them you can order 45 or 90 degrees pipe sections and direct them through a pipe jack on the side wall. All of them are described in details in my separate full reviews. Below I give only a few basic facts. Heating: I guess this should be obvious. Typically, tents are not great insulators. If it is cold outside, it will be almost the same inside. In a small tent your body heats the area but in a larger tent this makes no difference. So this is about a basic comfort. Cooking: The stoves presented here are all with a flat cooktop, and some even have extensions (trays) for a larger cooking area. So you have both heating and cooking facilities combined. Drying wet stuff: You know how it can be in the camp in wet conditions. Now combine this with cold so you can imagine. Some of the stoves have folding racks that can be used to dry socks and gloves. Otherwise, just pass a string in the tent and attach your larger items and they will be dry for you in the morning. This is essential and don’t underestimate the need for dry clothes. There is no other stove on the market that could come even close to this Fastfold Stove. With its weight of only 3.97 lb (1.8 kg) and the packed size of 15 x 9 x 2 inches (38 x 23 x 5 cm), this is a backpack-portable stove. The titanium used in its construction is a very tough metal so the stove is strong in spite of such a weight. All the elements in the package are shown in the picture. So you have a spark arrestor and an integrated pipe damper. Particularly interesting is the pipe which is one single titanium piece which you roll width-wise when you transport it, but you roll it length-wise to make the stovepipe. So this is an incredibly versatile stove for wood burning which you can use for a variety of outdoor activities. It also comes with a carry bag included. The firebox volume is 900 cubic inches (14.7 liters). The pipe length is 106.3 inches (270 cm) and the diameter is 3 inches (7.6 cm). Please follow the link to read more. Winnerwell Woodlander Medium Tent Stove. This Woodlander Stove is a stainless steel construction, beautifully designed and with some really great features. It includes all the elements you might need for cooking, heating, and drying your stuff in the tent. The stove is portable, and this implies the weight which is 20 lb (9.1 kg) and its packed size is 15 x 8 x 8 inches (38 x 20 x 20 cm). When you want to carry it, store all the elements inside, fold the three legs which you see in the picture, and fold up the side racks which then serve as a handle. As you see from the picture, the door is with a fire viewing window. The pipe is 2.5 inches and the firebox size is 800 in³ (13.1 liters). 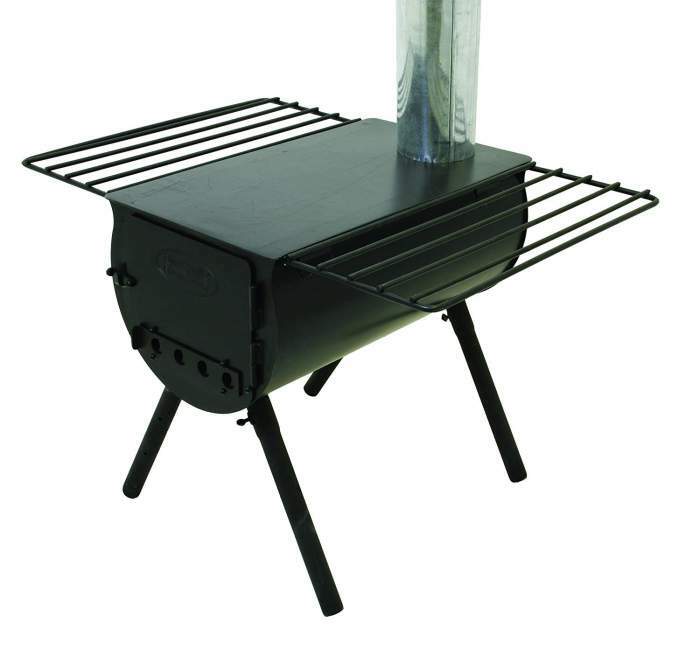 Winnerwell Nomad Medium Tent Stove. 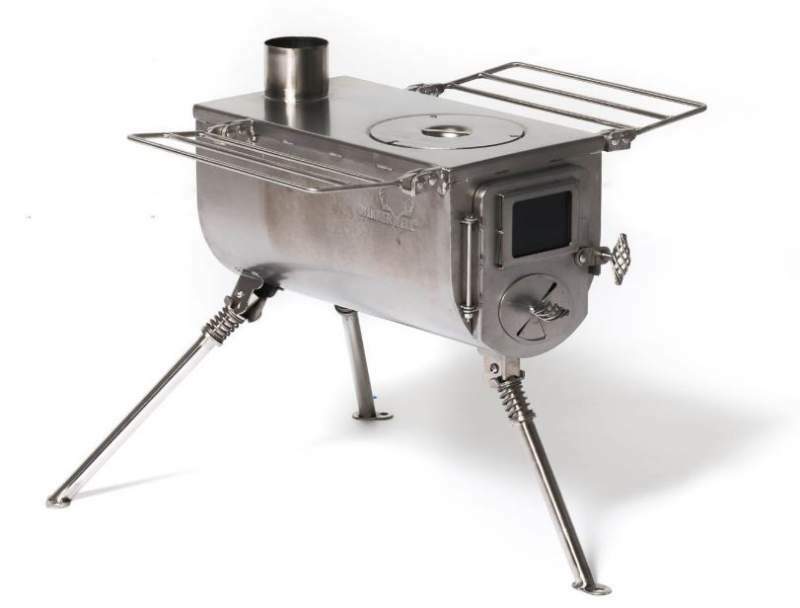 The Nomad stove is the third in the list from the Winnerwell brand, but as you realize from the picture, this is a completely different design. On the other hand, its features are such that it definitely deserves to be here. This is again a stainless steel stove and only slightly heavier than the Woodlander stove shown above. So the weight is 20.7 lb (9.4 kg) and this is a lightweight item, in between the ultra-light Fastfold Titanium stove and those heavier stoves below. There are many elements here and they all fit inside, except for the legs and the racks which are folding. The latter serves as a handle to carry the stove. Here too you have a nice glass window on the door. The pipe is with the diameter of 2.5 inches (6.3 cm) and the length is 14.4 inches (36.5 cm). The firebox size is 800 in³ (13.1 liters). This is a completely collapsible stove, so when you pack it, it reduces to 23 x 11 x 2.25 inches (58 x 28 x 5.7 cm). Though you still have the chimney which has 5 sections that nest in each other. The pipes start with 4 inches diameter and this is the official dimension for the pipe jack which they recommend. 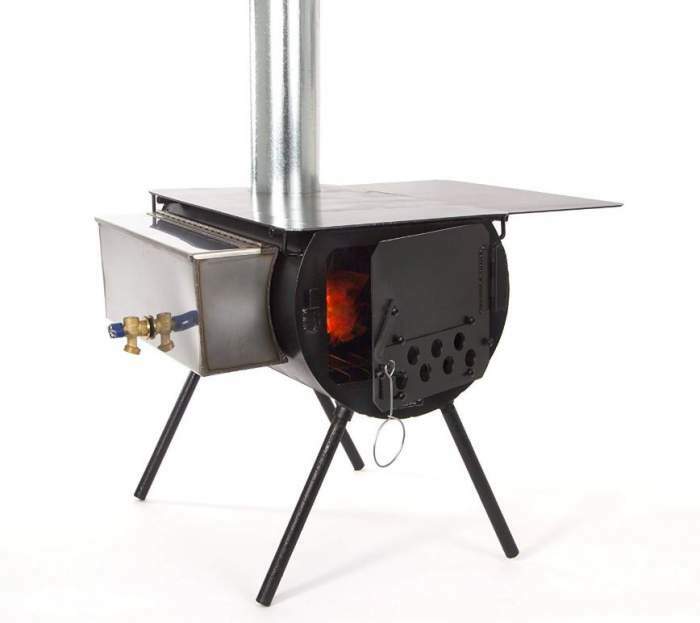 The stove is built from a 20 gauge (0.81 mm) cold rolled steel and you can use wood or coal to burn in it. The weight is 32 lb (14.5 kg) so it is not particularly light, but as I said its packed size is great. 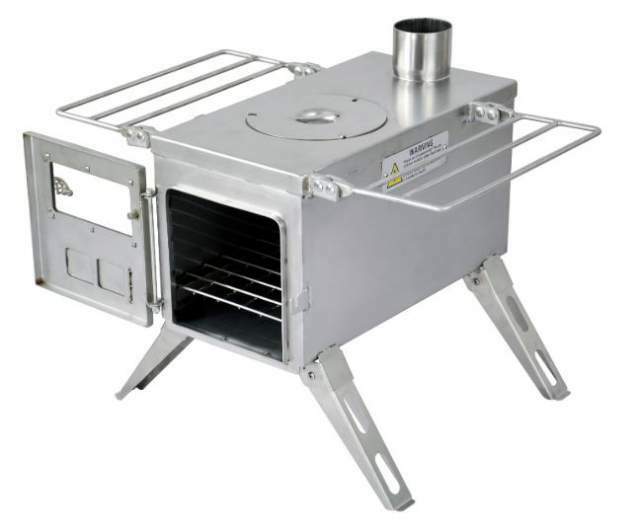 Camp Chef Alpine Wood Stove CS14. With the weight of 74 lb (33.6 kg), this Alpine Wood Stove is among the heavy stoves here in the list. But the weight is because if the strong and durable steel construction, with the walls around 1/8 inch (3 mm) of thickness. But the packed size is great because all the elements, including the racks and legs, fit in its firebox. Note that the legs are with an adjustable length so you can level the stove on an uneven ground. The pipe is 5 inches (12.7 cm) diameter and its length is 10 ft (305 cm). This stove is far more affordable than the other stoves above, just to know if you are on a budget, so check the link for the price updates. The Timberline Wood Stove Package is ‘package’ because you have all the elements needed for the stove to work, plus the water tank which you see in the picture above. The material and the structure is very similar to the Camp Chef’s stove above, though you have one tray here instead of two racks. This is again a steel construction built from a 10 gauge (2.59 mm) and 12 gauge (2.06 mm) steel. So it is heavy, the weight is 92 lb (41.7 kg) but note that this includes the water tank as well. The pipe is a nesting type, so it is the easiest type to assemble. The starting diameter is 4-7/8 in (12.4 cm) and the end is 5-7/8 in (15 cm) at the top. You have 5 pieces in the bundle, each 21 inches (52 cm) long. The legs are threaded so they can be tightened or loosened and you can level the stove on an uneven ground. Note this is a stove built in the US. The differences in the weight are enormous as you realize from the list above, but there are essentially two groups: i) backpack-portable stoves, and ii) those that need a car for transportation. If you plan to use the stove with the car, then the weight is not so crucial, better focus on the features and the price. Regarding the price, the Camp Chef Alpine is currently the most affordable of all the stoves in the list. You will notice that the pipes are in the range 2.5 – 5 inches. So bear this in mind if you already have a pipe jack integrated in your tent. If this is not so, you can choose any of the mentioned stoves and make the pipe jack yourself. The pipe diameter is usually equivalent to the burning power, the bigger the diameter the better burning power. So consider the Timberline Package as the first choice if the power is your priority. Some brands have a long list of accessories with their wood stoves. I have discussed this in my text on how to choose a wood burning camping stove. It is surprising to see how many useful elements you can have. So you can have a camping oven in at least two variants, to use on the cooktop, or attached to the pipe. Then there are several variants of the water reservoirs, various elbow-type pipe sections, and lots of other stuff. The Winnerwell stoves are champions regarding the possible accessories. 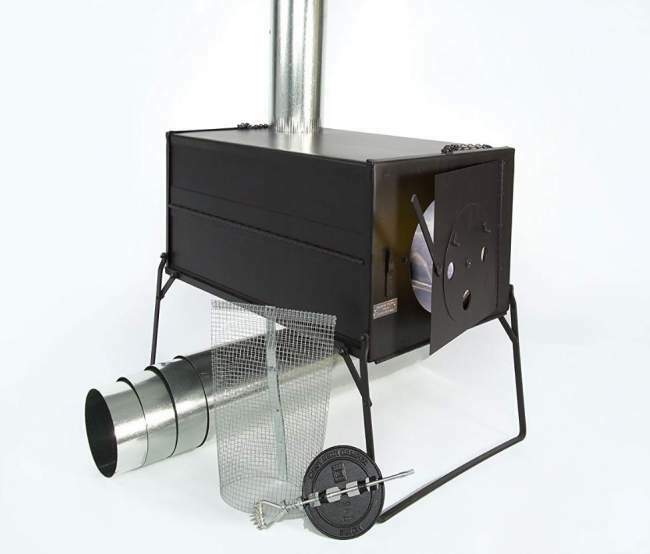 So this is my temporary list with the best tent stoves for wood burning, it will be updated regularly as new great models appear on the market. Note that right now there are many more stoves of this type on the market but not all of them are true top-notch items, I am trying to present the best ones. If you need a corresponding tent for such a stove, please check my list with tents for cold weather camping. Some of them have one or even two integrated pipe jacks. You will notice that there are such tents in the list which come with a wood stove included in the package. But see also my list with insulated tents, in such shelters you do not need heating at all. Please let me know if you think I have missed adding some good wood burning stove, there is a comment box below. Thank you for reading and have a nice day.